The project entailed the removal of the existing plaza deck pavers, and overburden, as well as the installation of a new waterproofing membrane and new plaza deck pavers. The plaza deck at the Astrophysics Department facility at Harvard College is also a courtyard for the science building. It has very difficult access which proved to be a challenge that was solved by Metropolitan prior to project commencement.The existing plaza deck membrane system was located under concrete pavers. The reconstruction project necessitated removing the over-burden, consisting of 2′ X 2′ concrete pavers and 12″ of drainage fill. Since the logistics and access were difficult, a system had to be devised and implemented so as to handle the material removal efficiently. Metropolitan devised a conveyor system which was set up on a single access stairway which served as the means in which the pavers were taken down from the deck. In addition, the entire construction project was handled in a manner that would not cause disruption to science offices adjacent to the plaza deck. A laser laboratory is located/housed under the plaza deck, and encased in a 2 foot thick reinforced steel concrete vault. One of the technical problems in constructing the new plaza deck was the manner in which membrane tied into the cavity walls adjacent to the plaza deck. The new membrane had to be tied into the wall waterproofing system so as to effectively seal the building envelope. The first two courses of masonry had to be removed from the adjacent cavity wall to allow access to properly tie the new membrane/waterproofing system into the underlying back-up wall waterproofing. The remaining brick courses of the forty foot high wall needed to be properly braced during this tedious operation. A high tech, reinforced PVC membrane was utilized. 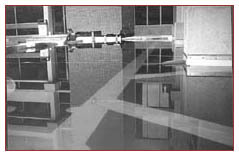 Metropolitan employed a heat-fusing technique in the installation process, thus achieving a monolithic membrane assembly. As a result of the heat-fusing, the seams of the membrane are even stronger than the membrane itself. Consequently, the seams will not be adversely affected by continuous water submersion, as water penetrates the overburden which consists of new drainage fill and new pavers. Metropolitan’s installation of the new membrane for the project was a loose laid membrane that included a containment grid system so as to ensure that any water infiltration problem that may occur in the future will be confined within a grid, making it much easier to pinpoint its origin. 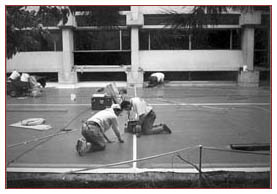 Prior to installing the overburden, the entire plaza deck, including each grid system, was flood-tested with a dye, to assure that the deck was completely waterproof. In addition to the difficult access, throughout the project Metropolitan had to work around and keep protected a valuable and irreplaceable sculpture which is permanently affixed to the plaza deck courtyard.